Altamura, a splendid city which lies on the Murge Plateau, not too far from Bari, offers an wonderful architectonic spectacle in the form of the famous 12th Century Federiciana (Frederick the Great) Cathedral. Altamura links its birth to the mythical disembarkation of the escaping Trojans who landed on the Adriatic Italian coast. During the journey from the motherland, which was unfortunately destroyed and lost, the population commanded by a friend of Enea (Aeneas) called Antellus, was thought to have founded a city and given start to a new populous and civilisation, as happened with the Sicilian city of Segesta. Here, in the Murge Plateau is where the Trojan Antello settled and founded the city. A further mythical story of Altamura cites Althea, Queen of the Myrmidons (Myrmidones), a mythological Greek population who disembarked on the Adriatic coast. The presence of man on the territory however, dates much further back and is lost in history as testified by the famous retrieval of a calcified Altamura Man on 17th October 1993 in the limestone grotto of Lamalunga; believed to have lived 300,000 years ago. Little remains of the ancient city’s famous megalithic walls (6th Century BC) which gave the city its name: that is Alta-Mura (High Walls). In the 2nd Century BC and during the Roman Empire, little by little Altamura lost its importance. It then knew firsthand invasions by the Goths, Vandals, followed by the Longbards and Saracens, before its rebirth with the advent of the Swabians in Southern Italy. Thanks to the marriage of Henry VIth to Costanza d’Altavilla, it became a Norman succession. The Swabians allowed Altamura one of its greatest periods of weath, during which the Romanesque-Gothic Cathedral was built (1234) and the City was proclaimed a royal city under the direct rule of Emperor Federick II. This determined an influx of people from all over the Mediterranean who wanted to feel free and be able to practice their differing religions. The “Claustri” (Cloisters) were formed (types of alleys leading to courtyards. There are approximately 80 Greek and Arabic types), which provided a place of worship for the foreign religious community. 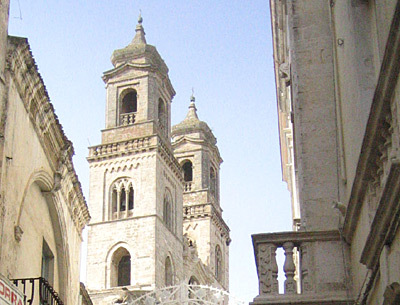 After the fall of the Swabians, Altamura passed hands to the Angioini, during which time the Cathedral was rebuilt following a devastating earthquake. It was therefore the Aragonese and many other noble families, amongst which the Orsini del Balzo who came from Taranto, who gave new impetus to the building of numerous churches. From 1538 to 1734, Altamura, under the Farnese Family, enjoyed a further period of development before passing hands to the Bourbons in 1734. This event came about after the marriage of Philip Vth of Spain to Elisabetta Farnese. Their son Carlo of Bourbon, among other things, opened the Royal University. The spread of liberal thinking brought to Italy by the Napoleonic campaigns, were well supported by a city like Altamura, who centuries before had already gained its independence and way of being. In 1799 a Tree of Freedom was planted and the City was proclaimed a Republic, but the participation of the Papal troops, commanded by Cardinal Fabrizio Ruffo, made this dream vanish a few days later. The City fiercely resisted with only three canons. It is for this reason it was given the name of Lioness of Italy. The City then returned to Bourbon control until the date of its unification to the Reign of Italy (1860). Apart from the previously cited Cathedral, there are many other churches of interest to visit: among them the nearby San Nicola dei Greci (13th Century) and the Church of Santa Chiara (17th Century). A visit not to be missed by those passionate about history is to the Dinosaur Caves in Pontrelli. This is one of the richest fossil deposits in the world dating back to the Cretaceous period (about 70 million years old).